A Long Island man was arrested Friday for threatening to kill supporters of President Donald Trump and Republican Rep. Lee Zeldin  then nearly hitting a Zeldin campaign staffer with his car, according to Suffolk County police. It was the latest in a string of attacks against the administration and its allies. Martin Astrof, 75, of Nesconset, became irate at the Suffolk County campaign headquarters of Rep. Lee Zeldin at 11:15 a.m. Friday, local police said. He threatened to kill a campaign worker, as well as other Zeldin and Trump supporters  then backed his car up in an aggressive manner nearly striking the worker, according to authorities. Astrof fled the scene and was arrested at his home Friday afternoon. He was expected to be arraigned Saturday on a felony charge of making a terroristic threat, and on second-degree reckless endangerment charges. Well that’s silly. We all know “confronting” PDJT (aka nazi white supremacists) supporters is justified. 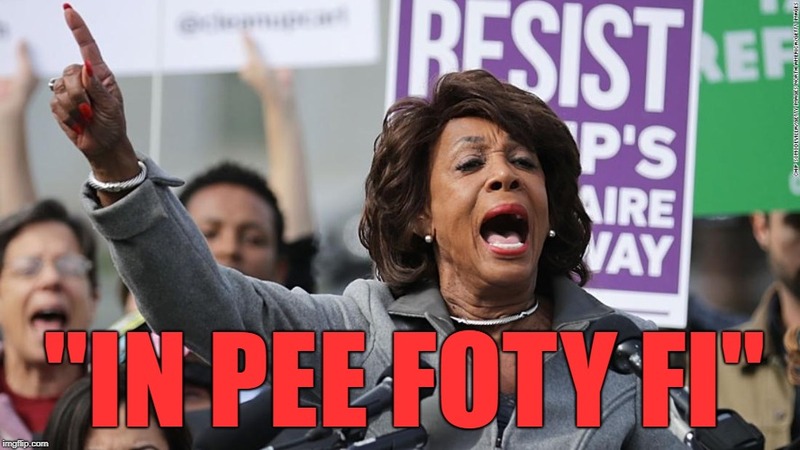 Chaulk up another one for Maxine Waters! Man, that is one repulsive, ugly wench.  >< She certainly is. But just think: she is very appealing to and smarter than those who continue to vote for her. Worse are the ingrates and half-wits who vote her in year after year. Anyone taking advice from Maxine Waters has serious mental problems to start with. The Damnocrats campaign of inciting attacks on Republicans and their staff as well as vile threats and comments by the Hollowood crowd is SURE to get the crazies out. That’s the intent. When someone gets seriously hurt AGAIN there wil be NOBODY to blame............again. When help is needed in minutes, the police are hours away. Be forewarned!! Unfortunately, this behavior will continue, and yes eventually lives will be lost. let’s have some fun with charging this ahole. Since Zeldin is the only Jewish Republican in Congress, any attack on him or his staff should be treated as a “hate crime”. Also, since Zeldin is a “minority” (i.e. Jewish Republican), his attacker can be charged with discrimination against a “minority”. The man he almost ran over is Italian so maybe some “gumba” will make him an offer he can’t refuse - do the loony bin or do the fishes. If the guy is wacko, he should be sentenced to an indeterminate length of detention to determine what he is suffering from (HINT: Trump Derangement Syndrome) and then sent to a loony bin for the next 3-5 years. He’ll be dead by then and not even a footnote in the Secret Service files. Max Yasgur. It was Max Yasgur's farm. But just think: she is very appealing to and smarter than those who continue to vote for her. You are correct sir. Those who vote her in, are more evil than she is. Yet another LIB LOSER who can’t accept that his life is worthless . A guy at work was fired on Friday because the boss thought he supported Trump. They got into a conversation over the guy that got arrested for stealing the kids MAGA hat.